Erik Spiekermann (born May 30, 1947 in Stadthagen, Lower Saxony) is a German typographer and designer. He is a professor at the University of the Arts Bremen. Spiekermann studied art history at Berlin's Free University, funding himself by running a letterpress printing press in the basement of his house. Between 1972 and 1979, he worked as a freelance graphic designer in London before returning to Berlin and founding MetaDesign with two partners. In 1989, he and his then-wife, Joan Spiekermann started FontShop, the first mail-order distributor for digital fonts. 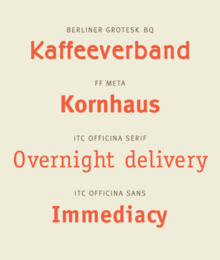 FontShop International followed and now publishes the FontFont range of typefaces. MetaDesign combined clean, teutonic-looking information design and complex corporate design systems for clients like BVG (Berlin Transit), Düsseldorf Airport, Audi, Volkswagen and Heidelberg Printing, amongst others. In 2001, Spiekermann left MetaDesign over policy disagreements and started UDN | United Designers Networks with offices in Berlin, London, and San Francisco. In April 2006, the Art Center College of Design in Pasadena awarded Spiekermann an Honorary Doctorship for his contribution to design. His family of typefaces for Deutsche Bahn (German Railways), designed with Christian Schwartz, received a Gold Medal at the German Federal Design Prize in 2006, the highest such award in Germany. In May 2007 he was the first designer to be elected into the European Design Awards Hall of Fame. As of January 2007, UDN has been renamed SpiekermannPartners, and as of January 2009 it has been renamed Edenspiekermann. The currently operative offices are in Amsterdam, Berlin, San Francisco and Stuttgart. Spiekermann is considered a very influential personality in the field of graphic design. He often attends international meetings, and has been giving a substantial contribution in several fields, such as app development and city plan. Spiekermann has designed many commercial typefaces as well as typefaces as part of corporate design programmes. Spiekermann co-authored Stop Stealing Sheep & Find Out How Type Works. He also participated in the creation of numerous corporate identities and other works, including redesigns of the publications The Economist and Reason. Spiekermann also appeared in the documentary Helvetica. 1 2 3 "Erik Spiekermann". EDAwards. 2006. Retrieved 2007-08-02. ↑ Fost, Dan (November 14, 2001). "Wired founder helps Reason". San Francisco Chronicle. Retrieved 2007-08-02. Wikimedia Commons has media related to Erik Spiekermann.